DO NOT turn the heat off. 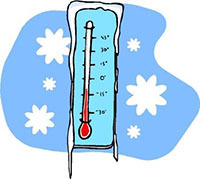 If you plan to leave your apartment for an extended time, please set your thermostat to 60 degrees and alert the management office that you will be away. Let the faucets slowly drip and open cabinet doors when temperatures fall below freezing. If you plan to use your fireplace, OPEN THE FLUE FIRST. Never leave a fire unattended. Extinguish a fire completely before going to bed. If you experience a water leak or a pipe has burst, please call (512) 345-8182 immediately and leave a message for our on-call emergency maintenance. As always, if you have any questions or concerns, please feel free to stop by or call our office.